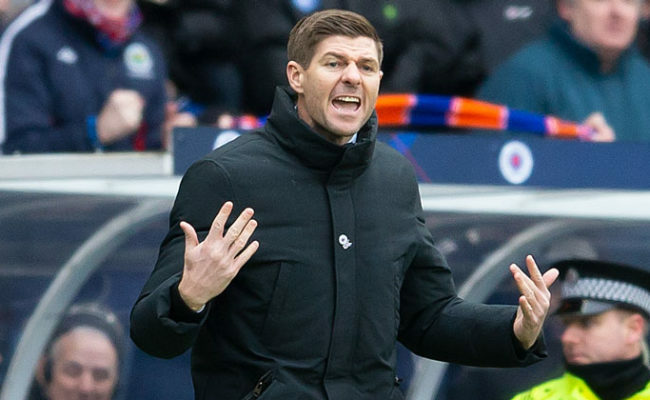 Alfredo Morelos missed out through suspension, with Jermain Defoe taking his place, while Borna Barisic was replaced by Andy Halliday at left-back. Gers emerged in their orange kit into what was an extremely blustery night here in Ayrshire, but as always, both ends behind the goals were completely packed with Bears who had made the short trip down the M77. The early minutes, however were dominated with the home side, who twice came close, firstly through a long-range effort from Conor McAleny which whistled just over the bar, and then from a quickly taken Chris Burke free-kick from the right of the area which Allan McGregor saved at his near post. Attacking opportunities were at a premium for the visitors, but they were awarded the chance to go ahead on 15 minutes with referee Alan Muir awarding a penalty kick. From the right, a Daniel Candeias cross went right across goal, and looked to be shepherded out of play by Kirk Broadfoot. 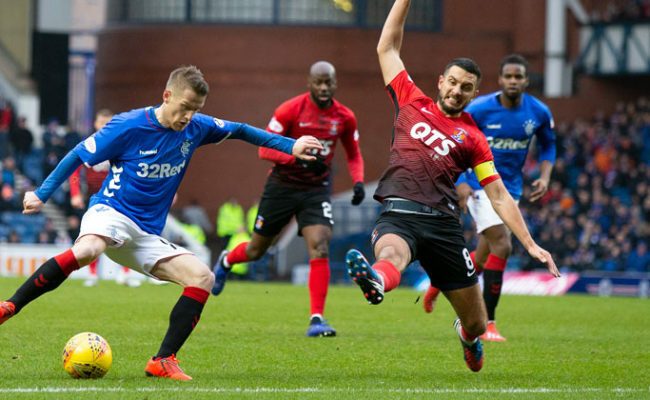 Ryan Kent had other ideas, and hounded the former Gers man until he won the ball before turning and heading for the area. Broadfoot set off in hot pursuit, before Kent laid the ball off to Scott Arfield, with his shot on goal being blocked by the hand of the sliding Broadfoot, who by this time, had made it back into the middle. It was an easy call for Muir, but James Tavernier missed his opportunity to put Gers ahead, with Daniel Bachmann getting across to his left to save the kick. Tavernier came close again soon after with a free-kick which Bachmann saved, before an almighty scramble in the area at the other end finished with Andy Halliday hooking a Youssouf Mulumbu effort off the line. A nasty clash of heads in a 50/50 between Ross McCrorie and Killie’s Alan Power resulted in a lengthy stoppage and Power having to be replaced by Kris Boyd. 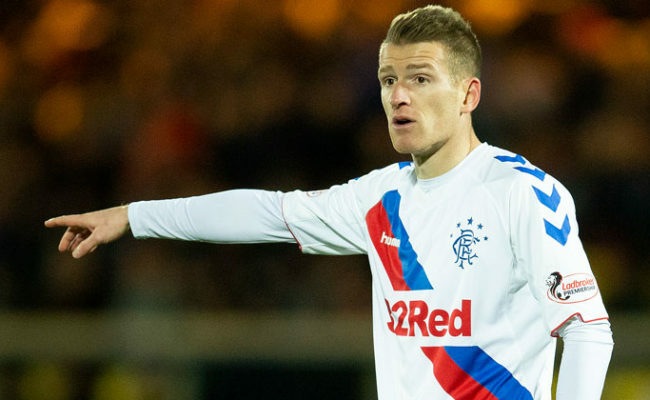 McAleny had another effort from distance off-target from a Boyd knock-down while at the other end, Joe Worrall headed wide from an Andy Halliday corner. It took really until the 79th minute for a clear-cut opportunity to come for Gers, and when it did, it fell to Jermain Defoe. A loose pass from Killie around 30-yards from goal was intercepted by McCrorie, and he played-in Defoe to the right of goal, but his shot and first real sight of goal in the game went wide of the far post. So a replay it is a week on Wednesday at Ibrox. RANGERS: McGregor; Tavernier, Goldson, Worrall, Halliday; McCrorie, Jack, Arfield (Davis, 37); Candeias, Defoe (Lafferty, 87), Kent. SUBS NOT USED: Foderingham, Katic, Coulibaly, Barisic, Middleton. KILMARNOCK: Bachmann, O’Donnell, Broadfoot, Boyd, Taylor, Dicker, Power (Boyd, 58), Mulumbu, Burke (Millar, 83), Jones, McAleny (McKenzie, 75). SUBS NOT USED: MacDonald, Bruce, Waters, Tshibola.